We specialize in carrying out all electrical repairs to all plant and machinery on sites in North Wales and the North West. We supply and fit fully reconditioned starter motors and alternators for all makes and models of plant and machinery. We check charging systems, diagnose faults and can repair or recondition any make of alternator or dynamo. 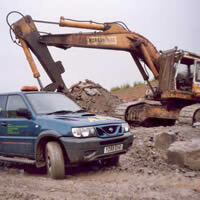 In fact, we repair anything from fork lift trucks and generators to wagons, crushers screens. We repair heavy goods vehicles (articulated lorries, tippers, low loaders, flat decks) all sizes of vans.